Database management, also known as database administration, is a specialized technical field dedicated to data storage systems and the individuals who design, develop, and use them. Most companies and organizations today rely on databases to track accounting and finances, logistics, shipping, and other sensitive information. Database managers ensure that these records are secure, organized, up-to-date, and easily retrievable at any given time. Database managers are found across a range of industries, including business and management, education, healthcare, criminal justice, and law. At the college level, database managers typically earn degrees in fields like computer science and information technology. As the industry expands, a growing number of colleges and universities are offering specialized degrees or undergraduate minors in database management. Most careers in the field are attainable to students with a bachelor's, and today, many students are choosing to earn their bachelor's in database management online. Web-based degree programs follow the same rigorous curriculum as traditional modules, and the asynchronous format used by most schools is convenient for students with part-time jobs, childcare duties, or other responsibilities that may interfere with campus-based learning. Read on to learn more about database management as an academic discipline, and to discover what you can do with an online database management degree in the field. WILL AN ONLINE DATABASE MANAGEMENT DEGREE PROGRAM PROVIDE ME WITH THE SKILLS I NEED TO ADVANCE MY CAREER? An online degree program in database management will introduce students to fundamental areas of the field like computer and web programming, software applications, data structure and network architecture. Students will also learn the best-practice methods and strategies for organizing, maintaining and updating organizational databases. Internships are somewhat rare in this major, but students will receive plenty of hands-on training as part of their coursework. WILL AN ONLINE DATABASE MANAGEMENT BACHELOR'S PROGRAM WORK WITH MY SCHEDULE? An online bachelor's in database management offers a flexible alternative to brick-and-mortar education. Students are able to access course lectures and readings, participate in online discussions with fellow students, submit written assignments, take exams and communicate with professors from the comfort of their home computer. Current technology also allows them to study on the go using a laptop, tablet, smartphone and other devices with Wi-Fi capabilities. WHAT JOBS CAN I GET WITH MY DATABASE MANAGEMENT BACHELOR'S DEGREE? After graduating with a bachelor's degree in database management, many students seek employment as database administrators. This large profession currently includes roughly 120,000 employees, and the Bureau of Labor Statistics (BLS) predicts the industry will grow by more than 13,000 positions in the next decade. Other common pathways for database management degree recipients include roles in network and computer systems administration, information technology, computer systems analysis, computer support or network architecture. Above-average industry growth is projected for all of these occupations, as well. 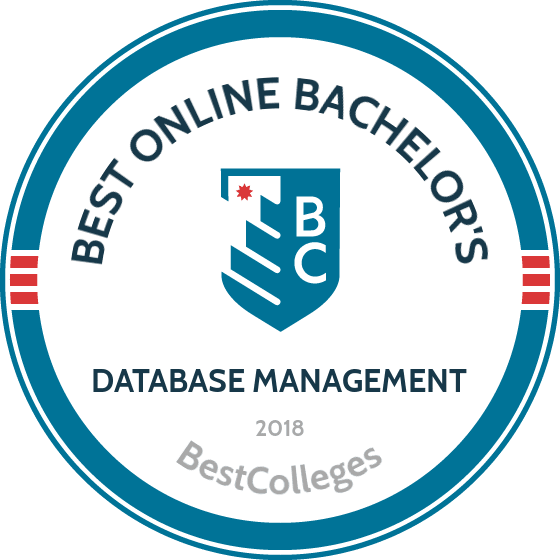 WHAT ARE THE BEST ONLINE DATABASE MANAGEMENT BACHELOR'S PROGRAMS? Choosing a program is a very personal decision, and only you can properly evaluate whether a target school's strengths match your educational needs. The following ranked list of schools should serve as a helpful starting point in your search for the best online database management programs in the United States. If you want to study database management, and you value the opportunity to take classes online, read on to learn more about the top online database management programs in the country. The online BS in data management/data analytics program at WGU helps students develop valuable skills in data flow management and business-oriented information conversion. Specially designed for working professionals and students who have already completed college-level coursework in computer science, the program also provides an excellent platform for distance learners interested in graduate-level data analytics, data management, business analysis, and MBA programs. Students also have the opportunity to earn eight officially recognized professional certifications at no extra cost. Western Governors is a competency-based, entirely online, not-for-profit institution with affiliated schools in six states. Students have full access to the school’s central library, which provides 24/7 research assistance and a comprehensive collection of scholarly journals, ebooks, and periodicals. Founded in 1985, Liberty is the largest private, not-for-profit online university in the United States. All courses are taught through the lens of a Christian worldview, making Liberty ideal for students looking to earn an online database administration degree in an environment that supports traditional religious values. Liberty’s BS in information systems program with a database speciality prepares graduates for careers in database administration, database analysis, database development, and data management. Coursework covers 120 total credit hours, and students with previous educational or professional experience can earn transfer credits for accelerated degree completion. Liberty’s students can also use school resources to prepare for dozens of industry-recognized certification exams, including Cisco, JAVA, Apple, and Oracle. Based in Tempe, ASU's innovative programs help students develop practical career skills. The university offers an online bachelor's of science in business data analytics that requires 120 credit hours and prepares students for careers as architects and operators of electronic information. Students gain skills in data aggregation, cleansing, integration, and analysis. The program comprises 41 asynchronous classes, which each last seven and a half weeks. This accelerated model allows working professionals to pursue the database administrator online degree full time. Classes include business data mining, dimensional modeling, and enterprise analytics. Students complete a capstone project during which they develop a model to increase a business' overall value. Applicants must submit SAT or ACT scores. Freshman applicants must have a minimum 3.6 GPA, and transfer applicants must have a 3.0 GPA. New York University is widely respected for its excellence in research and academics. NYU offers a bachelor's of science in applied data analytics and visualization that trains students to retrieve, analyze, and visually communicate the large amounts of data businesses and organizations collect, turning information into beneficial intelligence. After earning NYU's database management degree online, graduates often pursue positions in consulting firms, media companies, and marketing and advertising agencies. Students can earn the degree 100% remotely or in a hybrid format by taking some flexible daytime and evening courses on campus. The curriculum includes 128 to 130 credits in courses such as data visualization, cloud computing, and cultural and legal implications of digital technology. Under the guidance of a faculty advisor, students use electives to pursue advanced topics in the major. Students complete a capstone experience: a senior seminar or an internship. Located in St. Louis, Missouri, Webster prepares students to succeed in a globalized professional environment. The university offers a variety of distance programs, including an online bachelor's of science in data analytics. Students earning the database administrator degree online learn how to collect, clean, forecast, and present information that drives business decision making. Graduates work in a variety of industries, including private firms and government agencies. The curriculum requires 128 credit hours, and transfer students can fulfil up to half of the major requirements through previous studies. However, students must take all upper-level classes through Webster. Course topics include data analytics methods, decision support systems, and electronic commerce. Online students enrolled on a part-time basis pay a per-credit tuition rate, and full-time students pay a per-semester rate. Headquartered in La Jolla, California, National University was founded in 1971. The school maintains a long-standing commitment to diversity and has granted more master’s degrees to Hispanic and African-American students than any other college in California. NU’s online platform leverages cutting-edge technology to create an interactive, integrated learning environment that allows students to complete coursework at their convenience. National’s BS in information systems program is designed to bridge technology and business, delivering learning outcomes that position graduates for success in a variety of professional capacities. Students can also elect to join a unique transition program that prepares them for graduate-level study in information systems management. Southern New Hampshire gives online students the opportunity to earn a degree on an accelerated schedule. Students can begin classes at multiple start dates throughout the year, and flexible transfer policies can help you seamlessly transfer previously earned credit to SNHU. Distance learners can pursue a specialization in database management as part of the school’s BS in information technologies program. In the program, students focus on the relationships between data and business strategy, and build in-demand data analysis, network troubleshooting, and database integration skills. Students also enjoy 24/7 access to the school’s Smarthinking Tutoring Services, which connect distance learners with over 2,000 tutors who can offer tips and techniques to foster success in virtual educational environments -- making this one of the best online database management programs for independent learners. Developed in conjunction with local corporate chief information officers, UMUC’s online information systems management program focuses specifically on preparing students for leadership and management positions in IT-related fields. Coursework emphasizes key concepts in information system design, implementation, management, and security. Course content is regularly updated to reflect changing best practices and new technological developments. Located in Adelphi, Maryland, UMUC maintains more than 140 locations on three continents, and specializes in delivering relevant, intensive online education to working professionals. Students can access courses through the school’s Learning Experience Online (LEO) platform, which features smartphone and tablet accessibility, interactive calendars, and advanced communications features that support timely and responsive student-instructor exchanges. UMASS-Lowell’s online BS in information technology program is designed to deliver a well-rounded, foundational education. Core courses build skills in fundamental areas, and are supported by a broad, flexible range of IT electives. Students interested in database management can concentrate up to one-quarter of their degree requirements in the specialization, making it an ideal choice for those earning a database administrator degree online. The curriculum includes a total of 40 courses, covering 120 credit units. A public school since its founding in 1894, UMASS-Lowell adheres to a student-centered, not-for-profit model. The college’s division of online & continuing education has earned accolades from multiple prestigious educational rankings publications, including U.S. News & World Report. Online courses at UMass-Lowell are taught by accredited full-time faculty and adjunct instructors with extensive real-world, professional experience. UMA’s BS in computer information systems (CIS) program is available entirely online. Distance learners can access course materials through a combination of in-class, multimedia, and online delivery methods. As Maine’s third-largest public university, this school serves over 6,000 students at two physical campuses (Augusta and Bangor), eight University College centers, and 56 other sites throughout the state. Students in the online CIS program can specialize in several concentrations, and can earn their bachelor’s degree alongside documented professional competencies in networking, information system security, or web design and development. In 2015, the University of Maine at Augusta was listed at #30 in the Best Online Bachelor’s Programs category by U.S. News & World Report; it was the school’s third consecutive appearance in the rankings. There is no programmatic accreditation for this major field of study at the undergraduate level. Students should defer to the regional/national accreditation of their four-year college or university. Due to high industry growth projections and a steady demand for qualified professionals, the employment outlook for computing and information technology professions is relatively high. A recent survey from Georgetown University's Center on Education and the Workforce (CEW) found that college graduates with bachelor's degrees in 'computers, statistics and mathematics' fields face an unemployment rate of 4.3% after a few years in the workforce; by comparison, the national unemployment rate for all occupations is currently set at 4.9%. However, unemployment rates in this industry depend on the employee's specific field of undergraduate study. Using current data from U.S. News & World Report, the following table looks at unemployment projections for database administration and other common careers in computing and information technology. As the table indicates, database administrators are tied for the second lowest unemployment rate among the top technology jobs. And with healthy industry projections for database administrators and other related careers in the years to come, students should expect these favorable unemployment rates to remain steady. In addition to a healthy job outlook, employees in the tech industry also enjoy relatively high earning potential. The same CEW survey noted a median annual salary of $48,000 for inexperienced college graduates with a bachelor's in 'computers, statistics and mathematics'; college graduates with the same degree earn a median annual salary of $85,000 after a few years in the workforce. However, salary expectations in technology vary by specific job titles, as well as other factors like company size and city/state of employment. The next table looks at career salary growth for database managers, database administrators and other professionals in related tech professions. All five of the careers listed experience significant career salary growth. Database managers saw the highest growth rate: a 91.6% increase between the entry-level and late-career stages. Database developers ranked second, with a 51.1% salary increase after 20 years on the job. Salary growth for the remaining three occupations ranged from 32% to 44%. Students who graduate with a bachelor's degree in database management will be qualified for dozens of entry-level positions, as well as select managerial roles normally reserved for candidates with a formal education background. Four of the most common career pathways for database management degree recipients are outlined below. Database Administrators: Database administrators (or DBAs for short) use a wide range of tools and platforms to keep data ordered, updated and easily accessible. They also run software programs and applications to safeguard the information in these databases from hackers, computer viruses and other outside threats. Many DBAs work for computing and software companies, while others offer their services to insurance providers, banks and other non-tech organizations with consistent database needs. Network and Computer Systems Administrators: These administrators oversee the day-to-day operations of computer networks and information systems. Their responsibilities include monitoring traffic, performing hardware and software upgrades, running tests and implementing security permissions when additional users need to be added. BLS projects average growth for this profession, although jobs for administrators in the computer services industry are expected to rise by as much as 31% between 2014 and 2024. Computer Systems Analysts: Computer systems analysts are responsible for creating customized tools, platforms and applications for companies that hire them. First they must carefully research the company and learn about day-to-day operations; this background knowledge enables them to develop systems that are efficient, cost-effective and sustainable for the employees who plan to use them. Computer Support Specialists: Consumer support specialists assist consumers with computing questions or needs. This catchall profession demands employees who are knowledgeable about software and hardware, applications, servers, networks and other individual computing components. Support specialists can usually be found at any company with employees that utilize computers; others may work remotely as desk-help technicians or provide on-call support services. Making professional connections and learning about different approaches to database management is crucial to your success. Professional organizations offer a great entry point for students who want to learn more about their chosen career path. Below you'll find three of the country's most prominent organizations established for database management professionals. These organizations host networking events, provide online trainings, maintain active job boards, and offer other services for career-ready college graduates. Data Management Association International: Founded in 1980, DAMA International today represents thousands of members worldwide. The association hosts more than 70 global chapters on six continents, and hosts dozens of international events every year. DBA International: This nonprofit trade association currently works with employees of roughly 575 database-oriented companies. Membership benefits include discounted professional development courses, business planning guides and reduced entrance fees for industry events. International Association of Administrative Professionals: Established in 1942, the IAAP today offers certification in areas like organizational behavior and strategic planning. The association's website includes a vast resource library, job listings and a comprehensive industry events calendar. Despite the relative affordability of online criminal justice master's programs, most students still need financial assistance. Students should complete a Free Application for Federal Student Aid (FAFSA) form to learn more about loans, grants, and other opportunities offered through the U.S. government. Additionally, private grants and scholarships are widely available through nonprofit organizations, companies, and other sources. Check out our collection of resources below to learn more about financial aid options. Online programs can provide an affordable and flexible option for women trying to balance the demands of work, family, and earning their degree. We've curated a list of valuable scholarships specifically for women.